As in the fruit, date. Perhaps not as approachable as say, apples or raspberries, at least as far as dessert fillings go. Which I get, I mean they’ve got a pretty strong flavor. But every spring I actually get mild cravings for them, probably because my mom’s version of charoset always had dates in it. And the tastes pairs up well with oats. 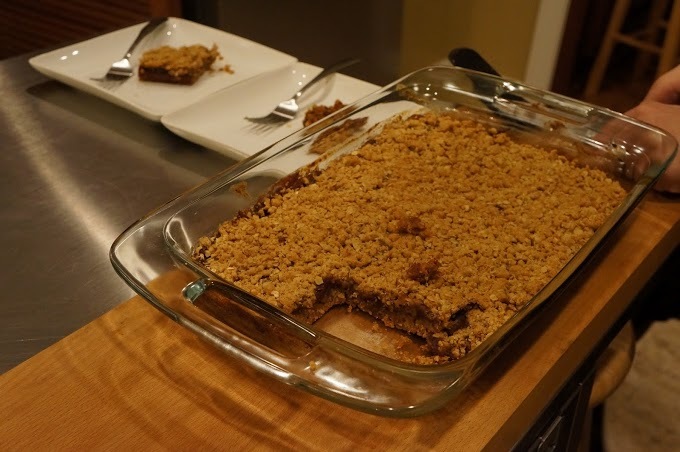 So, a few weeks ago, I took a stab at these oatmeal date bars. Preheat oven to 350 degrees. In a saucepan, combine dates, WHITE sugar (I used the brown by mistake at first, it was annoying to fix), and water and bring to a boil over high heat. Reduce heat; simmer, uncovered, and add spices and cornstarch. Stir occasionally, 10-15 minutes, until dates are soft & mixture is thick. In a large bowl, combine flour, oats, brown sugar & baking soda. Knead in margarine until dough forms. Press half of dough evenly in the bottom of a 13″x9″ pan. Bake 15 min. until lightly golden. Spread date mixture evenly over hot crust. Sprinkle remaining oat mixture on top. Bake 25 minutes, until golden. Cool completely in pan on a wire rack before cutting. NB: Again, make sure you use white sugar for the date mixture, brown sugar for the crust. Also it helps if you can sharpen your cutting blade before pitting and chopping up the dates – that step is probably the most time consuming. And voila! They came out really well. I have no clue what the serving size is for date bars, so we’ll just say this recipe makes however many servings you want it to make, depending on your appetite.